r, Crown Paints to introduce a wide range of premium Interior & Exterior emulsion paints to help you find the perfect color of your choice to crown your home. JAT Holdings has established an exceptional corporate reputation and is known for its association with world renowned brands. JAT Holdings has been confidently diversifying and expanding in terms of their portfolio of products and services with green practices in mind that will help protect the environment and sustain its natural resources, since its establishments since 1993. With over 200 years of trust & excellence, Crown Paints is the only British brand to hold a Royal Warrant granted by the Queen. Crown Paints is one of the largest and most successful paint manufacturers in the UK with a growing and ever expanding global presence. JAT Holdings has initiated a brand campaign to create awareness of Crown Paints in Sri Lanka. Crown Paints offers a range of quality products which are on par with global industry standards that can help fulfill your home and industry needs. 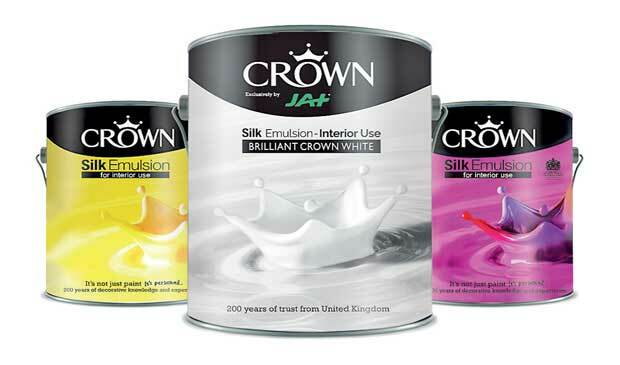 Crown Paints offers a premium quality emulsion for both interior and exterior. Most of the products belonging to the extensive portfolio come with properties such as a smooth finish, great opacity, excellent color retention, easy application and a high sheen or radiance in colors. In addition, the product is free of lead and other heavy metals in its manufacturing processes which signifies the product uniqueness of ‘Breatheasy’ element.